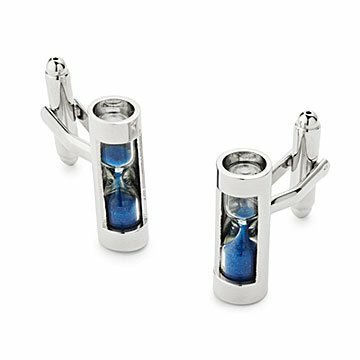 Joseph Cirincione's striking cufflinks contain miniature working hour glasses. Whether it's time for a meeting, or you're out having the time of your life, these cufflinks will have you there in up-to-the-minute style. Designed by Joseph Cirincione, each contains a miniature working hourglass, with vibrant blue sand for a pop of color. Makes a groomsman or graduation gift that will be treasured and used time and again. Made in China. Recipient wore it the day after he got it! Bought this for my doctor who has EVERYTHING. It is a unique gift and looks really nice. He wore it the next day to work. They are a present but happy with them!